Accordion books were made in Mexico and Central America by the Maya and the Aztecs. Their books were made from deerskin or amate, a paper made from the inner bark of trees. In Mexico, in the village of San Pablito, they still make the paper today in the same way. Strips of the inner bark are boiled in lye to soften them, then laid on a stone in two layers, one horizontal and one vertical. They are pounded until the fibers mesh together and form the paper. This book was made by Sr. Alfonso Garcia Tellez who is the shaman of the village. 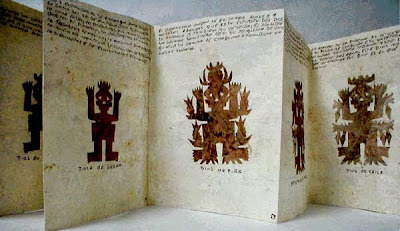 He performs ceremonies with the cut out amate figures and makes books about them. This book is An Offering to Bring the Rain which is about figures used to bring the rain and make the crops grow. The figures are gods of different plants. You can see the Dios de Pina, the God of the Pineapple, in the picture. This is an excerpt from Books Around the World on makingbooks.com.